Do you hear the horns? Click here to play! It's time for us to fight! You may not be a Gladiator yet, but you will be soon enough. Remember your training, stick close to your comrades, and watch out for the chariots. Very dangerous things, are chariots. Get too close, and you'll be run down. Stray too far, though, and the archers riding them will have a clean shot at you! Oh, the gates are opening - CHARGE! For Mars! ...Well, it looks like we survived to see another day. Good work on taking over that chariot, by the way. I doubt we could have won if you'd screwed that up! You know, I also think that the Emperor's sister had her eye on you. Don't ask how I managed to catch a glimpse of her in all the fighting, just think about the possibilities in that observation if you fight the right fights and say the right things. It's said she has a fancy for strong Gladiators like you - just be sure that the Emperor does not catch on. He has a taste for fighting, that one, and you can be sure you'll not walk out alive after a match with him. If you are to court his sister, do so carefully. You could walk away with your freedom and a bounty of riches, if you're lucky enough. 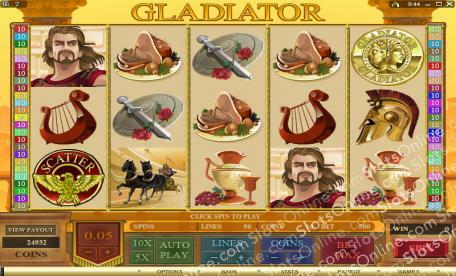 Live the glorious days of Rome and the gladiatorial arena in the Gladiator slots. Fight man and beast to make yourself a fortune in gold. The Imperial Eagle symbol is a scatter symbol that provides wins on total bets when 2 or more land on the reels. If 3 or more land on the reels, 100 free spins are also awarded. For money paid on the total bet, scatter symbols pay twice the bet for 2 symbols, 3 times the bet for 3 symbols, 20 times the bet for 4 symbols, and 250 times the total bet for 5 Imperial Eagle symbols on the reels. The Gold Coin symbol is wild, and substitutes for any other symbol that isn't a scatter symbol.